One dark eerie night I was resting in peace and comfort when suddenly I was jolted awake by a huge crash. My hair stood up on end. Bits of sweat beaded on my back. I lay still barely breathing. My wife asked in a hushed voice, “What was that?” I could imagine escaped convicts, or terrorists with dull knives come to butcher everyone in the house. Thankfully it was a shelf or a clock that fell, something dull and mundane. But across America many households are not so fortunate. In some homes women and men are found the next day in a pool of blood. Tragically even innocent children cannot escape some sadistic human reapers. The police and the SWAT teams do save countless lives but for some they arrive to late. No one can prepare for everything. Intruders can always catch you unawares. Motion sensors, dogs and even alarms can always be circumnavigated. Yet the more prepared and perhaps most importantly the more trained you are the safer your home will be. I love to read in the NRA magazines how from young to the elderly, all people can in certain circumstances protect the ones they love. In our era, home intrusion can be coupled with the fear of lone wolf attacks. Recently shootings are a normality. We never know when an extremist or unsettled neighbor decides to end your life. In the midst of these fears we realize the US is a very big target. Pearl Harbor and 9/11 shocked a country that felt unassailable. You and I know that in our lifetime any of a number of countries would salivate at the idea of invading our homeland. Thus each of our states is sanctioned by law to call eligible citizens to defense in a catastrophic event. Before such a time comes it pays to be ready! 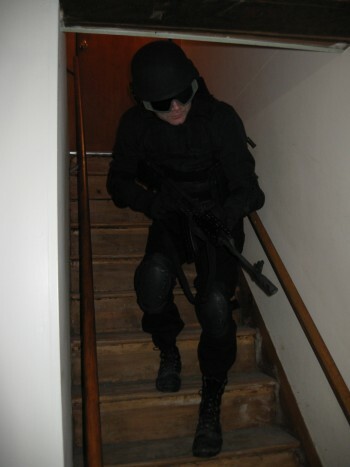 For my home defense uniform and gear I planned this with a budget in mind. I know there are always gun snobs, tactical snobs, and optic snobs along with a group of others who only buy gear that effectively excludes the rest of us. I gathered my list of gear with the idea of protective affordability. The PASGT helmet is heavy but provides good all around protection. Some add upgraded pads to enhance concussion protection. Upgraded chin straps can also be purchased to help make the experience more comfortable. 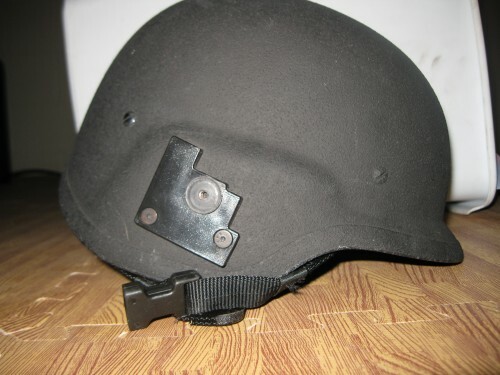 These helmets protect against some pistol rounds but do not stop rifle rounds. New helmets in various sizes and with different mountings can be purchased online at army navy sales for $124 used and $169 new. Ironically the moniker new only adds $45 to your bill. While the older steel pot helmets were thin walled with a plastic type helmet liner, this Kevlar helmet is thicker with Kevlar promoted as possessing a strength five times greater than steel. I also like the way the helmet drops to protect more of the side of ones face than more modern helmets. This helmet seems to have been in storage for most of its life almost having a new feel to it. My black Kevlar helmet started its life several years ago as a police helmet with a riot shied attached. This is an older style Kevlar helmet and was sold as old stock. Some claim that Kevlar after a certain age loses an amount of its protective properties. However in Ukraine I read that the UK donated some of their old Ballistic helmets, (they are not made of Kevlar exactly but of another type of ballistic material) to the struggling army. In researching on old UK helmets I read that they are inferior to PASGT helmets and have a propensity to mold. Thus if Ukrainian soldiers face Russian backed separatist in a helmet considered less safe than my old Kevlar, I feel vindicated in my purchase. These helmets are also heavy. Protection comes at an expense and this one feels like a couple bricks were added to your cranium. Also the chin straps are uncomfortable and the helmet has a tendency to slide. I don’t believe these problems are unique to only the PASGT but also to the newer service helmets as well. Along with a protecting helmet, modern operatives at times rely on googles to protect the eyes. New helmets in testing offer full head protection but for now these surplus goggles work. 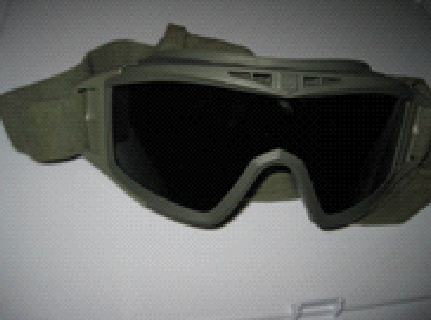 The Revision Desert Locust goggles come with clear and darkened lens. They are supposed to meet both the ballistic requirement for military shooting glasses and also perform to a higher standard which classes them at being able to repel .22 projectiles traveling at 550fps. A great article explaining this in depth can be found at the Lucky Gunner Labs website under the article eye protection and shooting glasses review. On his website he tested glasses, shooting them to really see how they held up. After reading the article I might go for a pair of goggles that definitely were almost new! In his review he found that glasses older than five or so years lost much of their protective ability. These goggles are huge but fit well. They claim to be anti-fog but expect to see some cloud to build on the glasses. Overall they seem fairly well built. The greatest asset was that this vest was cheap. At fifteen dollars it seems a stellar deal. Obviously this was only for the vest and without inserts. The vest has molle on the sides front and back. Thus I can attach ammo pouches and in the back I have my hydration pack already inserted. Inside there are pockets for hard and soft armor. Velcro again is used to make sure these will stay in place. I find myself wishing the vest had more molle. There is molle on the back and on the side straps but really none on the front except two rows on top. Also the vest came in tan so I painted it black with mixed results. The Velcro works but somehow with 20lbs or so of body armor I wonder how long the Velcro will hold up. The opening for your head is rather small so one might have to unlatch the vest each time just to put it on. One thing to realize is that armor is NOT COMFORTABLE! In all I am happy with the vest and it seems to be fairly versatile considering its low cost. 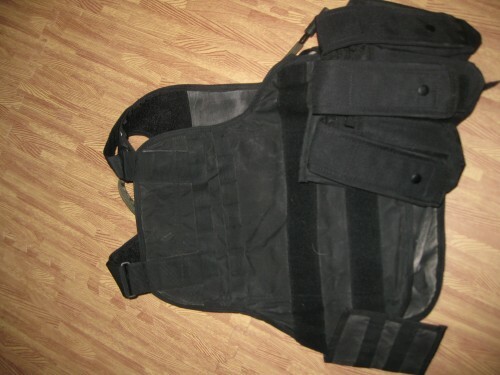 Body armor can be purchased many places coming in a buffet of sizes and types. Hard armor is usually steel or ceramic plates with ceramic plate considered better but more expensive. Soft body armor again is made by several companies. China evens imports armor many of which is marketed on ebay etc. I love ebay but just a caution research what you are getting! There are several ratings of body armor. Below is a simplistic explanation. Also note that stopping a blade is a bit different so tailor your armor for your perceived threats. For a while I scorned knee pads as bulky and for those unduly tormented by fear of bodily harm. But I realize that in a desperate situation the last thing you want to do is be found crippled by a busted knee. For a home defense situation knee pads might seem a stretch but such confrontation could evolve to an outdoor protracted firefight. Especially for those in secluded areas where help will not arrive soon. Imagine a nighttime vandal luring you into a woodland confrontation. 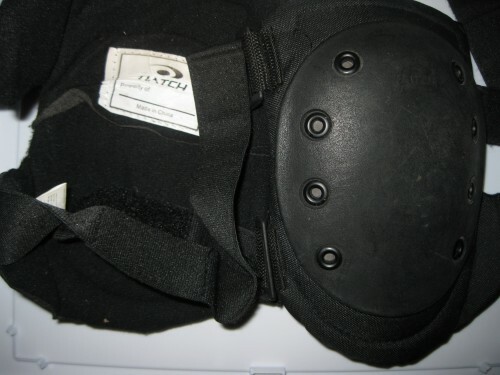 Or even the thought of kneeling on rough surfaces while you defend against a deranged assailant could suggest use in these padded inner and hard shell outer knee pads. Granted these scenarios seem far fetched and absurd but our world is not a safe place! The knee pads are serviceable. The Velcro is difficult to secure to a level of snugness. The pads seem durable and alright for what I need. The AMD 65 is a Hungarian AK that was built short for tank crews etc. and then lengthened in the US. I just purchased it recently so I haven’t had the chance to take it to the range yet. So far I have been very happy with the gun. I was able to find triple pocket Molle CONDOR pouch that accepts double mags per pocket thus I can hold six thirty round mags in one triple pouch. This pouch also has a place for pistol clips to be held inside as well. 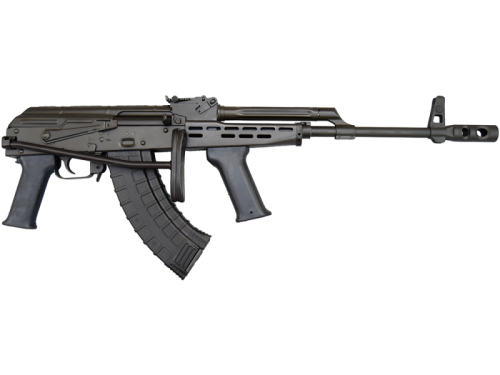 I also replaced the handguard of the AK with a UTG quad rail which seems very sturdy. The stock is hollow allowing for a cleaning kit to be stowed inside. I don’t like the pistol grip since it is basically painted rough wood but that is an easy change. I am also adding a Bushnell small red dot sight the TRS-25 to this rifle. Perhaps later I will detail this rifle further explaining in specific steps the upgrades and positives I see in this gun. For my tactical gloves I purchased some atv gloves from Home Depot. They are black and made of stretchy, foam, and synthetic material. They are not Kevlar plated but at $4 or so a pair they are pretty nice. My shirt is TRU-SPEC. I LOVE TRU-SPEC!!! Most other tactical brands seem to charge exorbitant prices. Again on ebay which I troll I can find great prices on TRU-SPEC. This tactical shirt I think only cost me $8 or so. At Wal-Mart I found the thin weight SOG black tactical pants. I wish they would have had cargo pockets but they still are great for the $5 I found them marked for on clearance. They are made of rip-stop material and repel water nicely. Again they are very light weight with an elastic waist. I bought about five pairs and I wish I could have found more! The boots I also found on ebay and they came to about $5. They are military pattern boots. Lace-ups with metal eyes and leather body over rubber soles. Overall I like these old boots better than some of the new tactical style boots. Before you spend over a hundred dollars on what is a glorified sneaker I highly recommend surplus boots in good condition. As I read sites and forums I realize that the availability of tactical gear is huge. When I find an item I like I usually first read reviews about it on Amazon. Then I head over to ebay and Sportsman guide. Ebay usually has better deals than amazon if you are patient. Sportsman guide sells a lot of surplus and tactical gear. With their free shipping over $49 they can be a good place to buy ammo if you can’t afford to save by buying large quantities in bulk. Cheaper than dirt I found only had my UTG quad rail cheaper than other sites. With its hefty shipping Cheaper than dirt is seldom cheap. For tactical guns Classic Firearms is a great place to go. JG, AIM and others may be as good but I find Classic usually has better deals. Again my gear is not only for protection but also a hobby as well. For extended hikes I have a black molle hydration pack. I will add my medical kit to the hydration pack and also some other pouches. Recently I purchased a handheld ham radio which I plan to get licensed on as well. Additionally an Ontario version of the K-bar knife I recently secured to a molle leg holster for hiking and survival purposes. The point is have fun learning the history and uses behind the gear as free Americans we are allowed to possess. Respect your gear and your neighbor! Let us as law abiding citizens take our Constitutional rights seriously and provide a just defense of our homes. El interés nunca es infefior al 2,2% mensual.